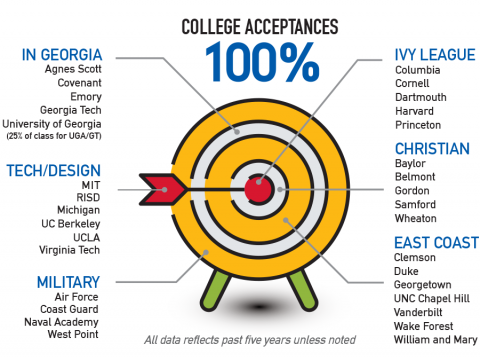 Our goal at Mount Paran Christian School is to find colleges offering the best possible fit for each of our graduating seniors. We help students cultivate their talents and interests to find their academic and extracurricular strengths and passions, then zero in on those colleges which will serve them best. College selection can often be confusing and even intimidating for families but our college counseling department helps make the process manageable and exciting. 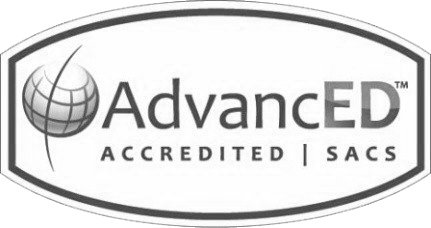 By answering questions and providing advice, we will guide you toward the college that is just the right fit for you. The first introduction to our college admission process comes in eighth grade when the college counseling department addresses rising freshmen and their parents during Encounter Week. The counselors provide general information relevant to college admissions throughout the freshman and sophomore years and gives an overview of options and requirements for college. In spring of sophomore year, students are introduced to an online assessment called YouScience. This is a scientific program taking students through a series of assessments designed to determine where they fall within the 14 key aptitudes utilized in the working world. Results include a review of the student’s strengths, suggested environments where they can succeed, detailed information on possible careers that match those skills and interests, majors that map to those careers, and much more. It is a great too for students to begin identifying what college and career path is best for them. Juniors take the PSAT (practice SAT) in the fall and receive feedback on their performance. Juniors who take the PSAT also compete for the prestigious designation of Commended Scholar or National Merit Scholar. Designations are awarded to top performers on the PSAT each year by the College Board. Juniors and seniors take the SAT and/or the ACT. The MPCS high school provides a comprehensive College Planning Guide - a complete notebook for all freshemen containing tips and schedules to aid students and parents in the college planning process. To request an additional copy of this guide, please contact Dr. Holmes. In the spring of junior year, students and parents are invited to a college planning kick-off night to learn about the college admission process. They then will attend an individual college conference with our counselor where the college admissions process is formally launched. 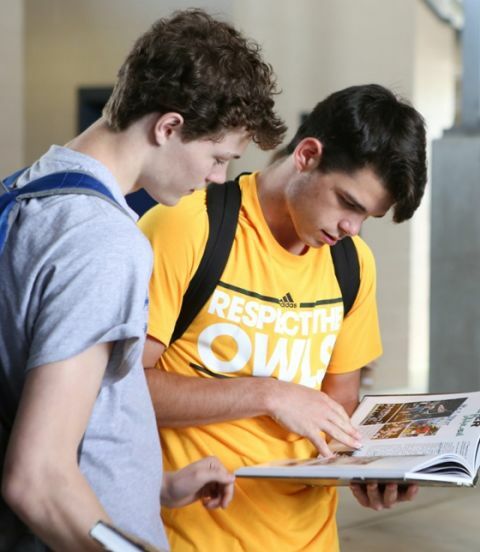 Throughout the year, the college counselor hosts a number of special sessions for families, communicates information about college fairs in our area, and assists in narrowing choices and setting specific college goals with each student. 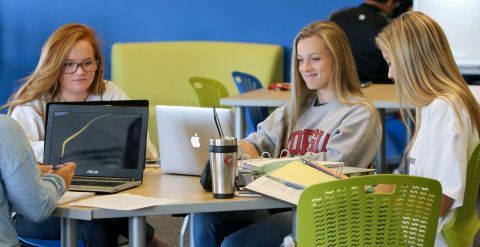 In addition to college tours, admission events, and one-on-one counseling, MPCS brings college reps on campus throughout the fall to meet with interested students. Paying for college is not easy, but can be accomplished by exploring all of the resources available such as scholarships, grants, and student loans. The best strategy is to apply early for financial aid from a college, as many awards are given on a first come, first-served basis. Read the WingTips blog "College Scholarships Cheat Sheet" for recommended websites to start your college scholarship search. Seniors have opportunities every week in the fall and early winter to speak with college representatives visiting our campus. Students work closely with the college counseling department to meet their chosen college application deadlines. MPCS seniors apply to multiple colleges, some deemed to be "reach" schools and some safety schools. Our goal is for every senior to have more than one exciting acceptance. MPCS is proud of the 100% college acceptance rate of our students. Read more about the "8 Tips for Choosing Your Ideal College" in the WingTips college blog series. Senior year culimates with Senior College Day, a celebration of the senior class' commitment to each graduate's university of choice. The day is complete with college spirit shirts, food trucks, yearbook signings, and recieving of their cap-n-gown and regalia. MPCS graduates from the past five years have been accepted into some of the most prestigious college and universities as listed below. Graduates were offered various academic, athletic, arts, and special achievement scholarships. Amount reflected above are scholarship offerings before the in-state HOPE or Zell Miller scholarships are awarded. 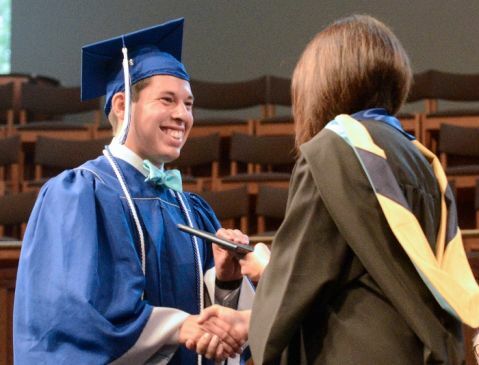 The last graduating class was offered an average of $65,000 scholarship dollars each. College representatives schedule visits to Mount Paran Christian School in the fall to meet with high school students to promote different colleges and universities. These visits are an excellent opportunity for our students to ask questions about the different colleges and get to know the college admission representatives, who often have input into the admission process at their college. Visits are typically held during student lunch and will be posted for students on the Dozier Hall message board, weekly announcements, and through the Remind text. If you are a college rep and interested in visiting MPCS, please schedule your visit here.